The 11-year-old golden retriever, Charlie, had his left eye removed due to glaucoma in 2016. A year later, his right eye was removed for the same reason. His owners Chelsea and Adam Stipe have had Charlie since he was just a little puppy. They try their best to care for Charlie that is now blind. The family has always wanted another dog and on the first day of 2019, they finally decided to welcome a new family member Maverick. Charlie wasn’t sure about the new addition at first, but he eventually got used to his furry new friend. Maverick began to support Charlie and help him out when he struggled due to his blindness.They’re both pretty crazy and special. They’re definitely our entertainment. 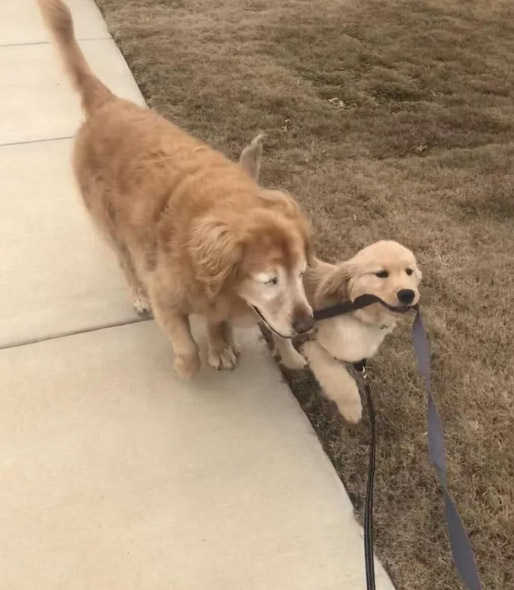 When they would play, Maverick would realize that Charlie would lose the toy sometimes, so [Maverick] would pick it up and put it back in front of him to re-engage playtime.They almost turn into little sled dogs where they’ll walk together.